My work has recently developed this recurring curve in the composition. 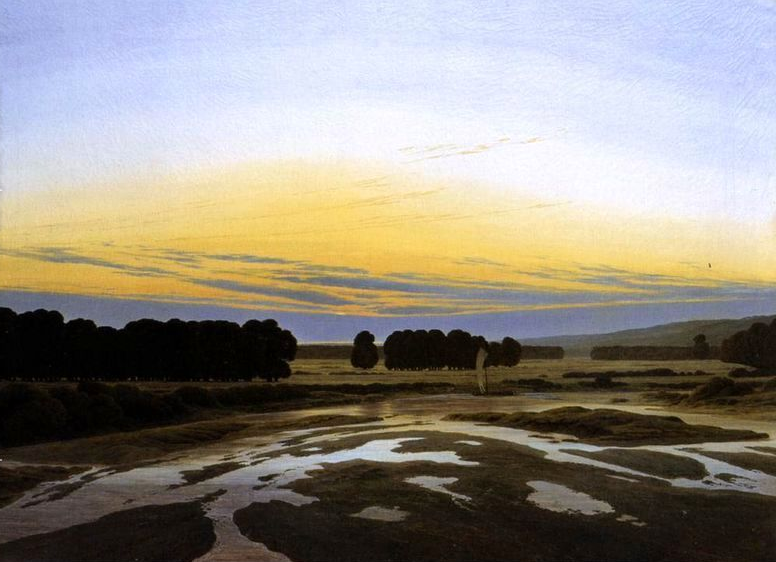 This intrigued me and has prompted me to research further particularly when I came across this painting by Casper David Friedrich. What I have discovered is that this was a tool used by the romantic artists as a reaction against classical composition. They investigated the curved space or curvilinear perspective. The convex lines emphasis the panoramic view so that there is a feeling of expansion of the landscape, the curvilinear form is how the human eye sees. This gives a sense of the artist being surrounded by the space rather than removed from it. The landscape becomes the artists own private space, although in a bubble. “So as to become what I am, I must give myself entirely to my environment. I must melt into the clouds and rocks” Friedrich. Turner also believed he could only paint the power of nature by subjecting himself to it and making it the only thing his eyes could see. Distorting the horizontal plane of a composition produces a sense of instability which has an unsettling effect on the viewer. 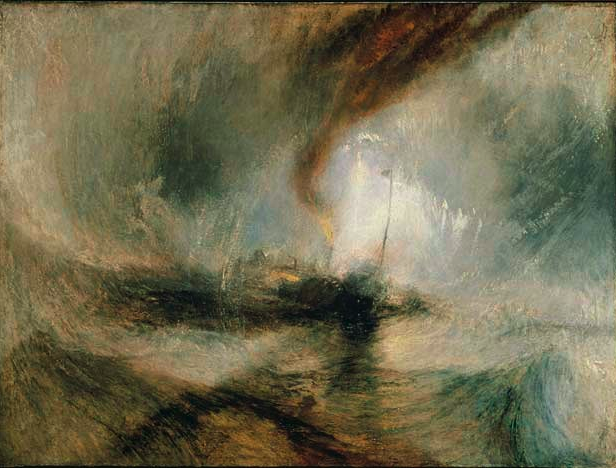 Turner takes this effect to an extreme in paintings such as the one below. The curve has become a complete circle totally immersing the viewer in the raging elements. Here the curvilinear perspective gives the image drama and dynamism. When I observe the landscape I feel as though it is totally surrounding me it is not just like a curtain draped in front of me. I place myself within it, part of it, enveloped by the elements. The panoramic views of the Humber bend themselves around my peripheral vision so my drawing does the same, wanting to extend the already limitless horizons. I am a Lecturer in Textiles at Hull School of Art and Design. As a visual artist I am interested in atmospheric conditions and events and how the scale of nature makes mans mark on the landscape look insignificant. I enjoy the act of doing and getting my hands dirty so my practice is intensly process led. I use a wide range of media but am particular interested in dying techniques. 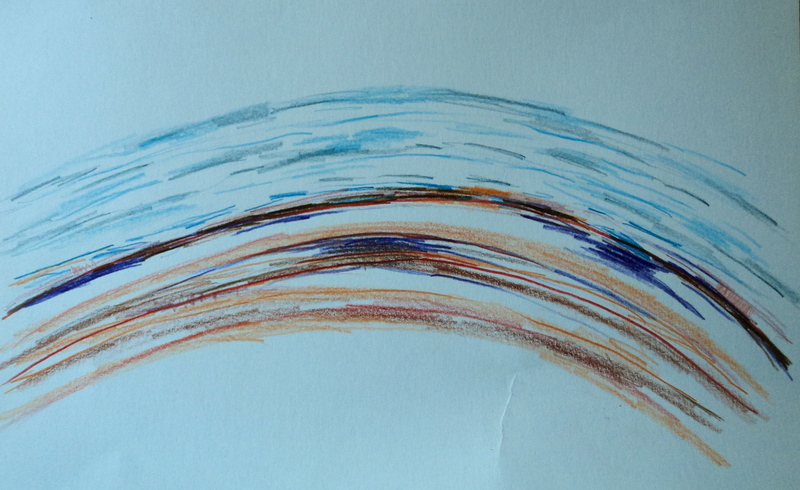 This entry was posted in Practice, Research and tagged Action Painting, art, Arts, Casper David Friedrich, curved space, curvilinear perspective, Drawing, Humber, JMW Turner, Kingston upon Hull, landscape, painting, panoramic view, perspective, River Humber, Sky, Techniques and Styles. Bookmark the permalink. An inspiring post. Never realized there is so much knowledge in curves!